"Easily convert between Latin and Cyrillic characters"
The free download offered here is called Cyrillic Character Transliteration Utility. 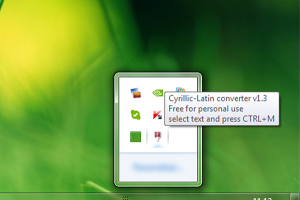 It’s a particular freeware tool you might be interested in to convert text from languages using Cyrillic characters, such as Mongolian or Russian, just to mention some, into Latin characters. Without entering into linguistic or technical details involved in the transliteration process, we can mention this is a simple and easy-to-use application that furthermore doesn’t require any installation to be performed. Hence, it can be considered portable and executed from removable or cloud drives. Once executed, Cyrillic Character Transliteration Utility will sit in the system tray area alongside your clock and by clicking it you can put it into action or stop using it by right-clicking it. As such, if you need to write using Cyrillic characters and there’s no suitable keyboard available for your language, this might be the solution to write text using Latin letters that will be transliterated.